“How can students contribute to the culture of Flevoland?” Guided by this question, the Zeewaardig team has been facilitating teachers and school-leaders from seven pre-vocational high schools (Dutch VMBO Level) in the province of Flevoland through the first Design Sprint for developing a new cultural education. In a series of six intensive “Design Sprints”, participants are led through a complete Design Thinking process; from researching the students’ needs to generating ideas and testing new formats for culture-lessons at schools. The Sprints are part of a three-year project in which, together with local cultural partners, each school will develop its own learning trajectory for arts & cultural education specific to the region. The first six Sprints form the pilot phase of this project, during which, our team will be given the opportunity to test and improve the structure of this process together with schools. In the pilot phase, each school is tasked with defining a learning trajectory based on the reality of each institution. In their own classrooms, participating teachers with test the ‘building blocks’ (lessons and activities) they’ve developed as part of the learning trajectory and curriculum, which we call the Learning Line. Co-design: a principle of our design process in which the end-users (in this case, the teachers) are supported by our team to design the solutions to their own challenges within the school. 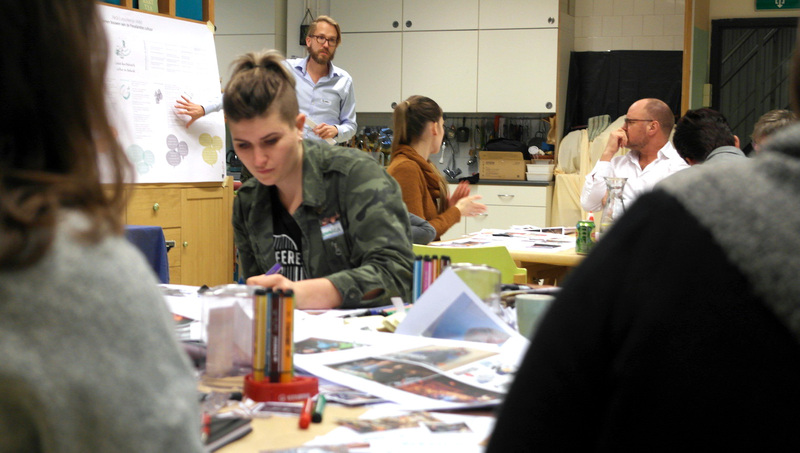 Our intention was to create an intensive program that would both stimulate creativity and provide sufficient structure for participants to confidently engage in the design process. We also had the challenge of taking into account the work-pressure of the teachers, the possibility of participants dropping out of the course, and the perspective of schools partnering with the cultural sector in the process. read more about the trajectory (in Dutch) at fleckVMBO.nl With these things in mind, we arrived at a program of six Sprints. Each sprint is a facilitated program of five consecutive days, from 6pm-8pm each day. With intervals of about one month between each Sprint, the design process spans six months. 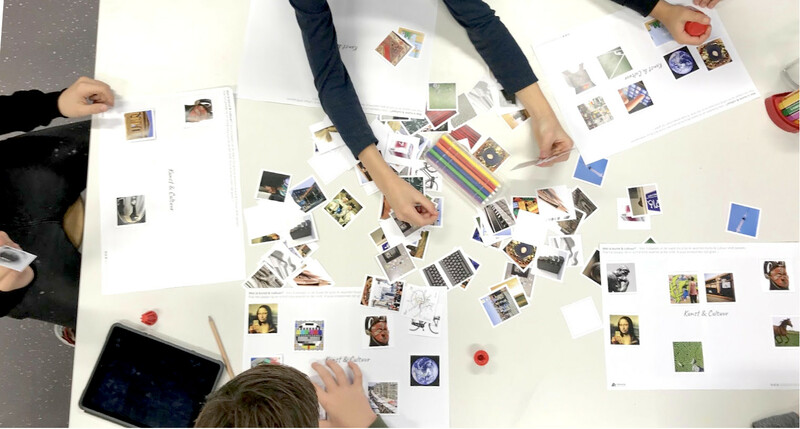 The cultural sector, school management, the pupils, and other stakeholders are invited to contribute to the design process at specific moments during the Sprints. The design process always begins by defining a design question; which problem, need, and ‘user’ are we aiming to design a solution for? What is the vision and what are the conditions that define the framework of the solution-space? In the first sprint, the teachers and school-leaders from the participating schools formulated answers to these questions. The next step in the design process is where things get really interesting; the in-depth research into understanding the target group. This research is done by the teachers themselves in their own classrooms to get deeper insights into their students’ needs and spark inspiration for innovative and relevant approaches. With our guidance, teachers are equipped with the mindset and materials they need to conduct this field research into experiences of their students. In the second Sprint, participants will analyze the results of their research to arrive at insights and inspiration for the next step of our design process: Idea Generation (Ideation). During six hours of creative brainstorming at full-capacity, we’ll guide participants in coming up with dozens of ideas for the Building Blocks of their VMBO Culture Learning Line. It’s easy for us to say that the first Design Sprint was a success. Our team enjoyed working with a group of creative, enthusiastic education professionals who carry an intrinsic motivation to develop better ways to share VMBO Cultural education with their students. We’re very grateful for our fruitful collaboration with our clients, FleCk and the Province of Flevoland, for providing the space for co-design and design thinking to make its debut in the field of education. The Zeewaardig team is excited to facilitate the coming five Sprints for educators in Flevoland and we’re already dreaming of how to make our Education Design Sprints available for even more educational institutions in and around the Netherlands.